Saint Isidore of Pelusium lived during the fourth-fifth centuries. He was a native of Alexandria, and was raised among pious Christians. He was a relative of Theophilus, Archbishop of Alexandria, and of his successor, St Cyril (January 18). While still a youth he quit the world and withdrew to Egypt to Mount Pelusium, which became the site of his monastic efforts. St Isidore's spiritual wisdom and strict asceticism, combined with his broad learning and innate knowledge of the human soul, enabled him to win the respect and love of his fellow monks in a short time. They chose him as their head and had him ordained a priest (The earliest sources for his life, however, say nothing of him being an igumen). 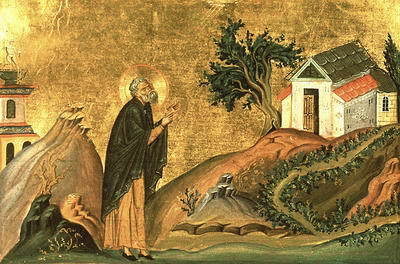 Following the example of St John Chrysostom, whom he had managed to see and hear during a trip to Constantinople, St Isidore devoted himself primarily to Christian preaching, that "practical wisdom" which, in his own words, is both "the foundation of the edifice and the edifice itself", while logic is "its embellishment, and contemplation its crown." He was a teacher and a willingly provided counsel for anyone who turned to him for spiritual encouragement, whether it was a simple man, a dignitary, a bishop, the Patriarch of Alexandria, or even the emperor. He left behind about 10,000 letters, of which 2,090 have survived. A large portion of these letters reveal profound theological thought and contain morally edifying interpretations of Holy Scripture. St Photius (February 6) calls Isidore a model of priestly and ascetical life, and also a master of style. St Isidore's love for St John Chrysostom resulted in his support of St John when he was persecuted by the empress Eudoxia and Archbishop Theophilus. After the death of St John, St Isidore persuaded Theophilus' successor St Cyril to inscribe the name of St John Chrysostom into the Church diptychs as a confessor. Through the initiative of St Isidore the Third Ecumenical Council was convened at Ephesus (431), at which the false teaching of Nestorius concerning the person of Jesus Christ was condemned. St Isidore lived into old age and died around the year 436. The Church historian Evagrius (sixth century) writes of St Isidore, "his life seemed to everyone the life of an angel upon the earth." Another historian, Nicephorus Callistus (ninth century), praises St Isidore thus, "He was a vital and inspired pillar of monastic rules and divine vision, and as such he presented a very lofty image of most fervent example and spiritual teaching." Guide our lives in peace. Therefore your spirit, venerable Isidore, rejoices with the angels. the Church is illumined by the brilliance of your words. She cries out to you: "Rejoice, all-blessed and divinely-wise Isidore."